The Volt will be sold worldwide after a U.S. launch. LOS ANGELES -- General Motors Co. sees limited sales of electric cars over the next five years and will ramp up output of its much-anticipated Volt plug-in cautiously, Bob Lutz, the automaker's vice-chairman, said. "This is uncharted territory for all of us," Lutz told reporters at the Los Angeles auto show. GM unveiled the production version of the Chevy Volt at the show last week. The battery-powered car is set to launch at the end of 2010 that has become a symbol for the automaker's effort to reinvent itself over the past four years. 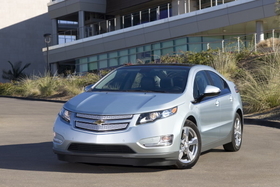 GM designed the Volt to comply with regulations for all overseas markets, Lutz said. He said GM would build 8,000 to 10,000 Volt models during the first full year of production with an eventual ramp up to production of 50,000 to 60,000 units. "I'm absolutely sure that demand will not be a limiting factor," Lutz said. But Lutz said electric-powered vehicles such as the Volt still faced hurdles in making it to mass-market sales volumes, including their higher prices. "The cost of the technology has to come down," Lutz said. Most consumers will be unwilling to spend the premium of thousands of dollars for a battery-powered vehicles unless gas prices are pushed higher with taxes, Lutz said. "We're not advocating that but if it doesn't happen it's going to be very difficult for these technologies," he said. GM has said it expects to price the Volt near $40,000 before a $7,500 tax credit for U.S. consumers but does not expect to make money on early sales. The automaker said it would offer the first Chevy Volt models for sale in California, a step that would signal its return to a market it was criticized for abandoning earlier this decade. GM famously scrapped an earlier experiment with an electric car marketed in California as the EV1, an unpopular decision that made it the target of criticism and the 2006 documentary "Who Killed the Electric Car?" Lutz said he believed that the auto industry was near a historic shift away from traditional combustion engines and toward battery-powered vehicles that would be "as momentous as the shift from horses to horsepower." But when asked, Lutz also said that the total U.S. market for rechargeable vehicles by 2015 might only be 250,000 to 300,000 units of annual sales. That would be about 3 percent of industry-wide U.S. auto sales in 2010 and about on par with the current market share for traditional gasoline-electric hybrids led by the Toyota Prius. The Volt is being designed draw its power exclusively from a lithium-ion battery pack that will be supplied by a unit of Korea's LG Chem. GM has said it is aiming for the Volt to be able to run for 40 miles (64km) on battery power in average conditions, meaning many drivers would be able to commute without using gasoline.